This is what YOUR BREEDER DOES for YOU!!!!!! MY DOGS ARE THE LOVE OF MY LIVE!!!!! Everyone wants a reliable honest breeder with healthy dogs. Well, you just found one!!!! There are no short cuts for a good breeder!I've been breeding for 34 years. Our dogs are bred together to produce the best temperament. I am AKC inspected and certified. That means that all my dogs are pure bred/no mixes, micro chipped, current on all vaccines, AKC records and clean facilites. Lots of cleaning and walking through the day, at least 4 miles by the end of the day. I also have a 5 yr guarantee on all of our dogs most other breeders have a l yr guarantee. I hope my gift of Loving these puppies will make a difference in YOUR life. The puppies are cherished and loved thru their journey of puppyhood.Constant supervison is needed as they are always getting into trouble!!! All my dogs live INSIDE my home, not in the garage or a kennel. When puppies arrive, nothing else seems to get done, they get held alot from day one. They get so many kisses, I stop counting. I play and laugh with them then momma flys in to see what she is missing!I take pictures of each new litter as if this is my first litter. This one is too cute sleeping over there, and this one is chewing her brother's ear etc etc. Selene , a Texas customer , has one of my beautiful dogs named "Suki" from "Lily" & "CinnaMan".Christine also has one of my beauties "Fancy Girl". And of course, if "Boomer" could talk he would say the same thing. 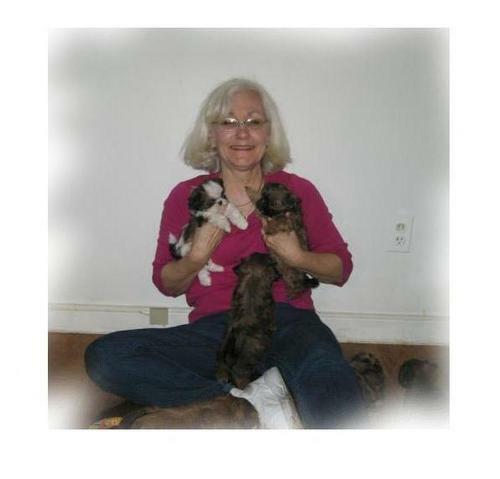 "There is no breeder like Dianne and no puppies like one of Dianne's babies ." My day as a breeder begins at 6:30 and ends at l0:30 unless I'm up at 3:00 to check on newborns and momma. Sometimes I've had to tube feed a baby if they are not getting enough milk, so then I'm up every 3 hours.You want to know how devoted and how much I love my dogs just read "The Incredible Story of 'Ace'" Our Miracle dog! All my dogs are tested on different dog foods to know what is the best digestible food for them. The top four are Nutro ULTRA all natural, Nutro Natural choice~chicken,rice and OATMEAL for sensitive stomach, 4 Health, only at Tractor & Supply co., This is extremely important as 75% of their growth depends on the best food for them,25% is heredity. Besides that they get a natural food enzyme, missing link, ALJ for runny eyes, and other vitamines/supplements for pregnant and nursing moms. I've studied nutrition over the years and have applied the knowledge to my dogs.Good water is very important and a must, especially when traveling, only use bottled water.I ad Apple Cidar Vinegar to the water.It has many amazing properties in it for your dogs. It for one helps allergies. Air purifiers in your house is also very important. I have them in every room. Also in the nursery I have toys galore and pee pads and their own radio. The pregnant moms go on pee pads and are not out in the kennel run that the other dogs go thru from the doggie door. Just a precaution for diseases that puppies can pick up since they don't have their shots till 7 weeks.A puppies immune system is low till they are 6 months. Last litter I took my pillows and my blanket in and slept with the "in distressed mom" till puppies were born. When puppies arrive, there are many nights that you don't get very much sleep. As the puppies grow, they are played with all day it seems, and the mom takes care of everything else. If you take care of the mom the puppies will not have worms. I'm very proud of that in my kennel.The puppies are handled from the moment they are born, and are very used to being picked up and loved. Then comes the socialization . I have several people come every week and play with them.Then of course, are the customers that watch them grow after they have bought them. We then cut their nails from the very first week as they can scratch their litter mates. If I happen to have more than one litter they are all separated in enclosed exercise pens so they won't hurt the younger ones playing as they are just stronger and more active. I'm a very protective mom, for sure! We play and exercise and I pick them up and weigh them to see how they are doing so that one doesn't get more milk than the other.When they are being weaned, I feed each one of them by hand so that each puppy gets their share of food. I match up a puppy to the owner so they get exactly what they want. For my customers who have bought a puppy I take pictures each week as they grow. They can visit their puppy before he or she goes home. In fact I encourage this for the bonding process. I have lots of information on how to take care of your new puppy here on my web site. The older dogs may get ear medication during the allergy season and their ears need to be plucked of excess hair. I do all the grooming of the older dogs or breed dogs and studs, then I groom the puppies before they go home so they look and smell nice! My job doesn't end there, I then give you advice from many yrs of experience in products and raising a wonderful dog. I am here for YOU to call for FREE consultation and follow ups. I also refer and recommend people who are looking for older pets since I know many breeders. My puppies are not just any puppy, they are made with the best nutrition, nurtured and loved as they are in my heart and this is my LOVE, my LIFE, to make a fine , companion for YOU. At times this is the hardest job ever, but the rewards outweigh anything negative. My entire being is devoted to them! I hope that my gift can make a difference in your life with one of my babies, you will LOVE, LOVE, LOVE our Little Paws!!! My husband and I met Dianne after a 2 hour ride from Northern VA, to see her dogs and her home. Strange as it is, my husband picked out Lily, on Dianne's website, and wanted one of her pups, because she was so incredibly elegant. She was elegant when we met her, too, and we made that 2 hour drive twice during her pregnancy, and many times after Dianne called and said, "LILY GAVE US TWO GIRLS!" Which meant that we got one! Dianne was generous enough to open her home to us for hours at a time, while we just sat and played with the precious pups and said our "thank yous" to Lily and CinnaMan. And that's how I got to know Dianne as the amazing human being that she is. She's given me the honor of being one of my dearest friends, doggy mentor, and shoulder on which to cry, and as we all know, "there are no dogs like Dianne's dogs!" I'm in Texas now, and I miss them all so very much! Aren't we all just so blessed?